The use of drones in the UK will rise over the next 20 years, raising "significant safety, security, and privacy concerns", a report has said. The University of Birmingham Policy Commission Report raised the prospect that the aircraft could be used by terror groups to attack public events. However, it also acknowledged greater use could bring "significant benefits" to the UK's security and economy. It called for "urgent" measures to safeguard British airspace and privacy. The research into Remotely Piloted Aircraft (RPA) was led by Sir David Omand, a former head of the UK's intelligence centre, GCHQ. It stated: "The security threat posed by individuals misusing RPA is a serious one, whether for criminal or terrorist purposes... more thought needs to be given to their employment for malign purposes in the domestic environment." It went on: "Vulnerable targets might be hardened to withstand attack from outside, but it is entirely possible that in a public space like a shopping centre or sporting stadium, an attack could be launched from within. Drones are also "ideal lookouts for burglars, train robbers and poachers", the Security Impact of Drones report said. And it said lightweight, commercial RPAs could become the "weapon of choice" for paparazzi in search of photographs of celebrities. Police in Merseyside, Staffordshire, Essex, Wiltshire and the West Midlands have acquired or used drones for surveillance, and guidelines must be looked at governing how and when they can be used, it said. The commission called for "urgent" measures to safeguard British airspace and the privacy of citizens to cope with civil and commercial use, which it expected to be more widespread by 2035. Currently, drones of under 20kg can be used within line of sight of the operator and with relevant permission of the Civil Aviation Authority. Enforcing breaches is likely to become a major policy issue, the report said, adding some drones were often being flown in breach of rules. 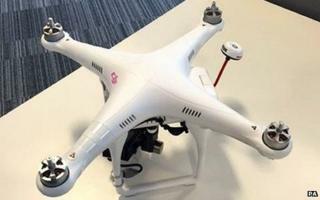 On Monday, a 41-year-old man was arrested on suspicion of breaching an air navigation order when a drone was flown over Manchester City's home game with Tottenham Hotspur. Greater Manchester Police said the drone could have posed a threat to crowd safety and could potentially have caused alarm to fans. Elsewhere, the Ministry of Defence recently confirmed the UK would fly unmanned drones over Syria to gather intelligence on Islamic State militants. Rivet Joint spy planes will also be authorised for surveillance missions in the region, the MoD said. Commission chairman Sir David said the decision was welcome provided the technology was used "in accordance with international law". "This commission has highlighted the need for more work on the policies for such applications, and we hope that our findings will help clarify the issues that will need more attention, as well as providing a vision for how the UK can exploit this innovative technology," he said.